Once upon a time, link building was a completely manual process. It was a case of going through search engines, finding links that point to competitors, going through various directories and lists of links, emailing people and literally beg them (or bribe them in fact) to get those links. Reciprocal link building was pretty big for a long time, although it wasn’t overly effective. A lot of people were involved in things that are now deemed as spam, which would now leave you with a variety of penalties and even getting your sites completely removed from search engines. Things such as spamming various forums and blogs or running sales operations on text links is simply not allowed anymore. However, in the past days of link building, this was actually highly effective. It quickly became clear that spamming for links wasn’t working. Instead, websites started to work on getting trusted links. Google’s team of search quality experts was focusing specifically on these types of links and they were developing methods of being able to better recognize and count links that were actually legitimate. Plus, they were getting better and quicker at penalizing those who did things wrong. People started to focus on link baiting instead, which allowed certain content to actually go viral. If this happens, you can literally earn thousands of links in a single day. The internet is never stagnant and things are changing again. Indeed, it seems as if even the likes of Google and Bing are starting to struggle to keep up with how the web is evolving. New types of data keep on appearing, which means algorithms to analyze them have to be configured and more. It is felt that Tweet counts are very important as links, but because it is easy to cannibalize this, it may change very quickly. 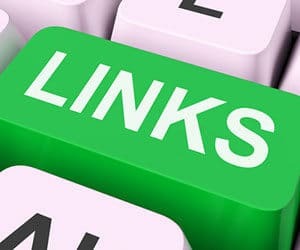 What definitely matters now is that links are new and up to date, so called “old crusty links” will no longer work in your favor. Brand name building is also growing, with keywords linking to brands becoming increasingly important. At the same time, the penalties for untrustworthy links are increasing as well. There are more and more filters that have to be stuck to as well. Google is also partnering strongly with Microsoft, because they understand what kind of surfing habits now exist. As a result, data is linked strongly to this, which stops the algorithms from making mistakes. One thing that hasn’t changed, however, is ad blindness. Indeed, 85% of all ad clicks on the internet come from just 16% of users. This means that ads have to change as well, or they will no longer generate revenue. It isn’t clear whether ads will indeed change, or whether they will be phased out. Paid inclusion, for instance, is all but gone nowadays. Last but not least, it is believed that someone is looking into all the non-linked references, which are the ones that come out of social media messages. It isn’t entirely clear yet how these will be made relevant, but it is expected that they will. For those who are involved in marketing or SEO in Vancouver WA, all of this means that you can never be stagnant. You have to evolve with the internet. It is only those that are able to adapt who can really make a difference and keep afloat in the changing world that surrounds us. It is likely that social media is going to be the most important thing of all when it comes to link building, but the how and when of this is not entirely clear yet. This means marketers can start to prepare to some degree, but there is still too much information lacking to really make a commitment to new developments. However, this is the way link building has always gone: it evolves over time and marketers evolve with it.